It’s our favorite Friday of the month here at The Mailbox Blog—the first Friday of the month! For this month’s giveaway, we’ve packed this adorable Dr. Seuss bag with school goodies for you and your students. Why choose a Dr. Seuss bag in July? Two reasons. First and foremost, I believe anytime of year is the right time of year for Dr. Seuss. And second, a never-before-seen picture book by Dr. Seuss titled What Pet Should I Get? is set for release this month! To be entered in the giveaway, leave a comment right here on the blog before midnight Wednesday, July 15, that tells us what family or classroom pet(s) you have or what you’d like to get! Congratulations to Elizabeth P., the winner of this month’s First Friday Giveaway! Tags: Dr. Seuss, giveaway for teachers, new Dr. Seuss book, What Pet Should I Get? We have butterflies and ant farms. I own a beautiful black peek-a-poo named Miley. She is the baby of our family. I would love to have this for my classroom! We have classroom fish then also get butterflies and meal worms. We have a crazy German Shephard at home named Heidi. During our organisms unit at school we have some guppies that we try to keep alive as long as possible. I have two grand puppies, a pom and a pug. Love to dog sit! We have a rabbit in our room. At home I have a dog name Max. Max gets into lots of adventures and my class writes about him in their stories! I have four glofish named One Fish, Two Fish, Red Fish, Blue Fish (named after the Dr. Seuss book). I have a blacklight on top of the tank so they really glow! We have three cats–all rescues! We have had numerous fish. We have a guinea pig named Pipsqueak. We call her Pip for short. My Head Starters love to feed her at lunch and they know when we get our lunch if she gets to share our lunch, such as apples, salad, carrot and celery sticks, oranges. That is one of our classroom job, the Zoo Keeper. They often remind new friends or adults the rules of the class pet….don’t put fingers in the cage and leave her water bottle alone. At home we have a large and in charge cat who thinks he’s a dog! I would love to bring a class pet into the classroom again this year. Probably something simple like fish. I would love to get an ant farm!! We have a cat named Smokey that we adopted from a shelter. She’s about 18 years old now, and always likes to sleep at my feet. If time allowed, I would love to have a big dog. However, we are a busy family, and I don’t think it would be fair to an active dog to be cooped up at home all the time. My roommate had kittens and I would always share stories about Gizmo and Buffy (the cats) with my students. Sometimes, they would ask about the cats before they would even say hello! It was a great way to connect with all my students. I have a pet dog, Leia. Unfortunately do to the lease, I am not allowed to have here with me. At least she can stay at my parents house and I can see her when I cisit. I would have been devastated if I would’ve to have give her up. I have puppy dogs at home, and would love a fish tank at school. We have a rescue terrier mix named Roxie McWhiskers. Before becoming part of our family she was a stray — now she has all the love one little doggie can handle! We had a cocker spaniel for 12yrs. Who passed away last year. I’ve been looking for a new dog but can’t seem to replace my faithful JJ yet. I don’t have a classroom pet but my home pet is a very hyper male puppy Chocolate Lab we rescued named Java. We have 2 dogs at home and a guinea pig in the classroom! We have 2 hermit crabs and 2 frogs in our kindergarten classroom. Both are very easy classroom pets and the children can help take care of them. I would live to have fish! We have a turtle named Jack who lives in a box and a dog named Ruby who loves to eat slippers! Our classroom has 4 Hermit Crabs – Herman, Joey, Snapper Jr., and Digger – all named by the students! For our home we have 5, yes FIVE, small female dogs – Princess, Belle, Annie, Jazzie, and Chica! We have a class fish in our class. I have an adorable guinea pig named Rinny who is 4 and a half years old now. She is so sweet! We have an enole, a guinea pig, a few butterflies, and several fish. I love Dr. Seuss! I have a pug named Goober at home, and our class pet is my tarantula named Rosey! The kiddos love Rosey!! We have a fish. Her name is Bubbles. At home we have four cats and two dogs. I used to have a guinea pig at school but the district said mid year that we could no longer have mammals as class pets. I have a fish tank for the classroom, but have not filled it this year. At home I have chickens, ducks, guinea pigs, gerbils and dogs! We aren’t allowed to have classroom pets so I make sure to have a variety of stuffed animal pets the kids can talk to and cuddle with including a certain Cat in the Hat we all love! In the past, I’ve had iguanas and butterflies as visitors in my classroom. But in 31 years, I have never had a class pet. I’ve grown up with cats as pets all of my life. We currently feed a black mama short-hair cat and are hoping she’ll feel close enough to us to bring home her kittens. I would like to get my home a German Shepherd like I had when I grew up! We are praying and working hard to afford a house so we can get him one! I have a husky that I am currently training to be a therapy dog for my class and my school! We have a classroom pet that’s a frog! The kids love to watch him swim around. We would like to get more fish to keep thereof company? We have a pet Betta names Cuddles in our preschool classroom. My kiddos refused to let me take it outside!! We have one pet that stays in our room all year. His name is “Panchito” and he is a large stuffed panda. He is a ninja panda and is always watching the kids to make sure they are working together. He moves throughout the day when we leave the room and sometimes works with the hardest working group. The kids absolutely love him! We also get visited every year by Elfie our Elf on the Shelf. The kids keep an Elfie journal on how he behaves. I would really like to have a “real” classroom pet that the kids could write about each week. We have fish in our classroom. We also have a science kit rotation that includes, worms, pill bugs, guppies and goldfish. The children love them! We have butterflies in the springtime. I don’t have a classroom pet. But I have 3 dogs and a cat at home. No pets in the classroom but I would really like to get a turtle or fish tank. I have a horse, 12 chickens, and 2 dogs. My classroom pet is a hamster named Nell. The students love to feed her bananas and chase her around the classroom when she’s in her excersize ball. We get butterflies every year and then release them. I also tried tadpoles but was never successful. We technically are not allowed classroom pets but I have a Sheltie and Leopard Tail Gecko at home. I don’t have a classroom pet, but would like to have a hermit crab. I have two new guard puppies, Spike and Ringo, that keep us entertained. I have three adorable Japanese Chins that were rescued. In my class, we have caterpillars and butterflies in the spring. I teach 5th grade and was thinking about a classroom pet(s) for the upcoming year…an ant farm! I didn’t want something I had to send home over breaks or make sure we fed/watered it, and think having an ant farm might move on to other things like watching a team work, writing/drawing about what’s going on, great discussions! Here’s to the ants! My principal won’t allow real pets so I’ve purchased stuffed animal pets. Each week a different student gets a different pet and we talk about the care for the pet. I love encouraging students to use their imaginations and this is one way to do just that. They imagine/pretend to feed and care for each pet. I even introduce strange animals (like dragons) so students REALLY have to use their imaginations! We have a crazy black & white large terrier mix dog at home, along with a guinea pig that was originally a class pet. My PreK class has a hamster they named Cinnamon. They love being able to be involved with feeding it and cleaning its cage. They absolutely adore her and ask to take her out every morning ! We have a gecko that we share between classes and we also have some plants that the students like to watch grow and take care of throughout the year. When I taught second grade for two years we had a class pet guinea pig named Glitzy! Glitzy was a constant joy for the children. She loved to be around them and the children loved reading to her throughout the day! She taught us the importance of responsibility and showing compassion for others. Glitzy often went home with families over the weekends and then returned with pictures and stories to share with all of us. I always swore I would write a book one day about Gallivanting Glitzy! At home I have two cats, Babie & Manny. Babie is a short-haired calico and Manny is a long-haired buff color. Both are rescues – Babie was found at a playground in a box with her other siblings, and Manny came from an animal hoarding situation. Both cats provide so much love for my family, and are also well known in my classroom through stories and pictures. I wish I could share the picture of Manny wearing his Dr. Seuss hat! i would love to win the bags for my students. What a great way to start the school year off after 15 years being at my home school and now going to another school. Since my room will be decorated with the Dr. Suess Theme I would love to have two fish bowls just like the book 1 fish 2 fish Red fish Blue Fish. That way it all ties into the theme. I’d like to get a tadpole and raise it until it’s a frog to let my students see the life cycle in action. We have hermit crabs in our classroom. They are so fun! I have a very curious kitten. I do not have any class pets. I do have 3 cats at home though. I would love to have a cat for my house and for my library I would love to have a large fish tank. My classroom pet – a stuffed owl named Ollie. If I were to get a live classroom pet, I would love to go with tadpoles. We have a 22 pound cat named Charlie and in the classroom we get butterflies and a frog. My 4 year old is picking out a fish today. No classroom pets. At home we have an adorable yellow lab mix! She loves kids but hates cats & birds! I’ve had fish as a classroom pet. My students loved them! We used them as a writing center. We don’t have a live classroom pet but I am thinking of trying a stuffed animal pet this year as I have read a few posts about this ! We have two rescue dogs- a retired racing greyhound named Belle and an adorable mutt named Jake. We also have two rats named Remy and Jenny. We had a cat who was also a rescue, that died last week. Her name was Daisy and she lived to be over 18. In our classroom, we hatch butterflies from caterpillars and watch frogs develop from tadpoles! I would love to add this book to my Dr. Seuss collection for my students. I have a cat at home but am seriously debating a turtle as a class pet this upcoming year! We have a rescue beagle mix named Hazel, because of her eyes. We imagine she is a mixture of all kinds of Seuss like creatures. I don’t have any classroom pets, but our family has a dog and a cat. I would love to have a bunny! I think the children would enjoy something they could take out and play with. I would love to get a little bitty lap dog. I have 1 cat and 2 dogs at home. I would like to have a class pet this year, maybe a frog or a hamster. Every year my kindergarteners study the life cycle of the mealworm so I get 100 of them. At home I have a silky terrier named Toto! We have a beta fish named agua. We named it that because I have a couple Spanish speaking students that have taught the other students that agua means water and it kind of stuck when we named our fish. This will be my first full year of teaching. My theme is going to be Dr. Seuss! I have thought about a classroom pet. We have three dogs and two cats at home! I have had as classroom pets red belly frogs, fish, and a turtle. Have 1 dog, and 11 ducks in our pond. I would love to have an ant farm or fish in my classroom. At my job they don’t allow any class pets. But in previous years I had hamsters as a class pet. The students really liked the hamsters even when we would clean the cage and put the hamster in its mobile ball and roll around the class. No classroom pets, but I have four fish at home. I would LOVE to get a dog though. I get to watch one when the family is on vacation and I call him my “adopt a dog” because I pretty much have adopted him and buy him things all the time. I wish I had the time to get a puppy and train it, but I’d feel bad leaving it all the time with work. I have a cat and two dogs at home. However, I don’t have any pets in my classroom. We have a rescue dog we adopted last fall…the sweetest guy ever! Our family pet is a dog and her name is ‘Ele’ele. She was named that because she is black and ‘ele’ele is black in Hawaiian. In my preschool class we have guppies and our tadpoles just turned into frogs, so we have 3 frogs. We would love to have a fish or turtles! We don’t have a class pet, but have a wonderful, sweet rescue cat named Chester, who makes us laugh everyday. People say he is lucky that he got us, but we feel lucky that we hot him! I would love to have a fish or hermit crab in my classroom. We had a class fish. Unfortunately he did not live until the end of the year. Our newest additions to the classroom are a thousand or so worms! Worm farming, making compost, and recycling our classroom food waste! We also have fish, a snail, butterflies and chicks in the spring, and whatever else the kids come across and want to study further! At home, it is much the same- 4 cats, 3 chickens, 1000 worms (home with me for the summer! ), and a turtle. My daughter wants a rat, and I want her to outgrow that want… maybe some sage advice from the great Dr. would help!! We don’t have a pet at school, but I would love to be able to have fish or something for my kiddos to take care of. Our preschool just lost our hamster “silly girl” and will be replacing her soon with another hamster. My class pet is a frog, but he’s at home with us for the summer. At home we have a golden retriever. We have silk worms, praying mantis,lady bugs and a lizard. All in a family child care. I am hoping to get one of those self-sustaining fish tanks for my classroom this year! I have a beta fish. I recently came across a Dr. Seuss book that I had never heard of before. It is titles McElligot’s Pool. Anytime is Dr. Suess time! I have two dachshunds at home who bring my husband and I lots of joy!! I have a cocker spaniel and yellow lab at home. In class we’ll have a fish and butterflies! I have a Yorkie named Zipper. We just recently found out he has diabetes, so we had to start insulin injections. I would love to have another Yorkie, but not sure when that will happen. We have a cat at home. He acts like he owns the place. Our family has 3 cats named Motor, Daisy, and Belle. We are “Thinking Outside the Hat” this year in our GT class rooms. Our pets are focused on literature ties with ” My, Oh My Butterflies!” Where annually we are engaged in an international Monarch butterfly rearing, releasing project. This gift would serve over 75 GT students 1-4 grades. We have two miniature Schnauzers, names Shadow and Sweetie and a beautiful red mixed setter and chow, named Samson. We also have a long cat ( whom thinks he is a dog) named Sneakers. We love them all. Forgot to mention that I would love to get tropical fish. We have 2 dogs at home but we also have my class pet, a bearded dragon named Toothless, for the summer. He’s so much fun! Two dogs, two turtles and one fish! We have caterpillars/butterflies.in my classroom. I would love to have tadpoles. Dr. Seuss is the greatest! I have 2 dogs at home, we have a class fish (beta) that the students name, read to, take care of and babysit over vacations, and someone wins it at the end of the year. The students always come back and tell me how they continue to talk and read to the fish, etc. We also have therapy dogs read with all the students in my class and we are close to Newtown CT with some students in our school so we also have a comfort dog come and visit! Our classroom pet every year are 3-7 gold fish. Sky our 6 year old boonie dog. We got him in Saipan when my husband and I were there teaching. He made the long trip from the islands to Washington state to be with us. He is such a special member of our family. Our family pet is black weiner dog named Spike. We were told he was a miniature, but he weighs 16lbs. He is definitely not a miniature. In my classroom I always get the butterfly larva so my students can observe the complete butterfly life cycle. I had a rabbit named Camry for years as my classroom pet. She was allowed to run around the classroom all day and my students were responsible for helping to take care of her. She taught them how to be kind and caring towards animals and how to be a responsible pet owner. We have a labrador, Penny! Would love to have this in my new 1st grade classroom!!! The whole school had a hamster in a cage that they could admire each day while reading The World According to Humprhey by Betty G. Birney. Now I would like to have two fish in the library to join us while we read and write about One Fish, Two Fish by Dr. Seuss! We have a house full, 4 dogs, 2 cats and a tank full of fish! We have 2 dogs, a corgi and a dapple weenie dog, 3 cats and 6 kittens and 25 chickens. Too many! I used to keep a hamster in my classroom. The kids loved keeping a journal about his activities and making their scientific observations for life science. My classroom is a Dr. Suess theme from bulletin boards to truffula trees, even my birthday prizes for my students are Dr. Suess. We have had butterflies and a fish. Each year we have pet week where children can bring in their pets to visit or spend the day. It’s a lot of fun to learn about all the different pets. On Friday we always talk about what pet they would get if they could have any they wanted. Would love to win this for my classroom!!! At school, I have a tarantula named Daisy. At home, we have 7 cats and 2 dogs! Madagascar hissing cockroachs. The were really cool, order less and safe for little people to touch them. I would love to have the new dr. Seuss book. We have cats and a bearded dragon at home; fish in the classrooms. We are looking into a parakeet or fish for the home. I would prefer fish, but the kids and dad want the bird. I have 2 dogs at home. I currently do not have a class pet, but I used to have a hermit crab in my classroom. At my school, we have a Hermit Crab named Claws. At home, we have different types of fish and a cat named Princess Cupcake (PC for short). At home, I have a mother and daughter Chug pair. In my preschool classroom, I had fish. Currently, in my fifth grade classroom, no pets — yet. We have a pet turtle named Henry. I would like to add fish to my classroom. I have 2 dogs and 2 cats at my house. I have a therapy dog that has gone to school with me to visit the students. He has even helped students who were very fearful become more comfortable around dogs. We debated for a long time. My husband just retired from 39 years in public education, so we got him a puppy! We named her Molly. She is pretty active so he will have lots to do while retired. We will also be grandparents for the first time and our theme for the baby shower is Dr. Seuss! We love his books! We hatch chickens in our room and keep them til they run all over the classroom…then they come home with me to join our flock. I give the kids updates on the babies as they grow…one of our science standards is parents and offspring and animal life cycles. I’d love to have a pair of alpacas. I had a turtle once the kids loved it and butterflies for a short time. We’re no longer allowed to have pets in our classrooms, however when we did I had two guinea pigs and a fish. At home we have four chickens, a bunny, and a fish. So excited for the release of Dr. Suess’s new book! I would love to have fish and frogs. My family has a hound dog named Dixie and a Tabby cat named Daphnee. We have a dog, two outside cats and a plethora of birds in our large yard. It’s great living out in the country! But if there were a pet I would want to get, it would be a puppy! We just adopted a rescue shelter cat. Her name is Poe Pretty Pretty Princess. She’s an 11 month, 4 1/2 pound ball of energy and cuteness… much like The Cat in the Hat. Hi! At home, we have a beloved inside kitty named Tiki. She sleeps with us and is our best friend! At school, my classroom has a pet hedgehog, four fish, and a lizard. My students lesrn how to treat and care for animals! This will be my first year teaching so I don’t have any classroom pets yet, but I am excited to get a puppy for a family pet! We have fish named PatrickSpongebob. We would like to get a dog. I have a dog and cat at home and we had praying mantis’ at school. The local college hatched babies and gave them away to be raised. Not allowed to have pets in the classroom anymore but used to have mice and the kids loved them!!! At home we have a sweet dog named Olive. In my classroom I would love to have a fish tank. They are easier, and less of a chance for the kids to really mess with it. My class has a pet rat, Cece, and a baetta fish, Thriller. We have a cat and would like to get a dog! We have no classroom pets this year, but I have 2 dogs and 2 cats in my family! I have had a classroom pet in the past, perhaps a pet this coming year would be fun for the students. My theme to begin the school year is Cat in the Hat. I used it last year as well and the students enjoyed it. Things I cannot purchase, I make myself and they have the red, white, and turquoise color scheme so they match. Also, Dr. Seuss books are fun for word play! I would love for my Pre-K class to have a goldfish! Something they can take care of on their own to help teach how to care for something and responsibility!!! They would be so excited!!! We have a chinese dwarf hamster named Penelope. We are also getting ready to hatch chicks. I think our best pets are our pet rocks. Yes, rocks lol. We found them out on a walk and the children painted them and we put them all in a basket at our writing center. The children love to make up stories with them. I have one big dog and one little dog and a goldfish at home. Always we have five fat hens and they lay brown eggs and pale greenish blue eggs. I am thinking of some fish for the classroom next year. We don’t have a pet in our class, but I’d like one.. Maybe a fish! We have a lab, 2 beta fish, and an aquatic frog! we have a molly named shark bite, we are looking for a lizard. It would be fun to have a bunch of fish in my classroom! The kids would love it and it would teach them responsibility and how to care for something else. I have six dogs, six cats, and three hermit crabs at home. I would like to have an ant farm, a butterfly display and an aquarium in my classroom. We have 2 cats and 3 fish at home, but your daughter would love a hedgehog! We have a 160 lb dog and 2 hermit crabs. We have two dogs, a husky and cocker pop, and two kittens. In my classroom I have two fish tanks with goldfish and an upside down catfish in one and tetras in the other. At home, we cannot have furry friends, but we have several fish tanks full of fish!! Our Convict Cichlids even spawn regularly. At the center I am at, we also have fish; however, it would be really neat to have a rabbit or something similar. I’m doing my 2nd grade classroom in Dr. Seuss this year. I’ve had fish and hermit crabs in my classroom. I’ve even had a rabbit! I always have my students write a persuasive piece on what a good class pet would be for our classroom. It’s always a fun activity. We have a lab and two cats at home. In our science kits we have snails and beds Beatles in class. I would love these materials for my classroom! I love getting new items for my classroom and students! I have never had any classroom pets. But I have 2 dogs (Natalie and Ann) and 2 cats (Tiny Dancer and Henry). I just got through fostering a kitten named George. We had a turtle for several years named Myrtle (Seuss reference) but she, sadly, passed away a few months ago after she somehow flipped over in her tank while we weren’t home. I have a beautiful albino german shepard. I also have a calico cat. I am thinking of having the students work towards a goal of earning a pet hamster for the class. We had a goldfish named Finnagin, 2 hermit crabs named Hermie and Herman, and tadpoles named Kermit and Robiin and hatched butterflies. I plan to have a fish in my classroom, and quite possibly a hamster. It’s a decision I will make with my third grade class. We are considering a new puppy at home. I would love to have a rabbit in the classroom. We have a frog and a battery operated fish. At home we have a cat. We have two betta fish-Elsa and Rocket. I plan to get a betta fish for my classroom in the fall and I will be naming him Lips the fish to go with one of our reading strategies-get your lips ready by reading the first sound that you hear! We have a poodle, Zane, a calico cat, Callie, and 2 goldfish, Charlie & Charlotte. No class pets in my 3rd grade class, but 2 rescue dogs at home–Jax and Jolly. I also had a rabbit named Peter Cottontail that lived to be about 10 years old. We name all of our family pets after Denver Broncos players. Our current pet is a tabby cat named Peyton, and she plays fetch. I would love to see therapy dogs used in schools!! Such a calming effect for both kids and staff members!! In reality, 4th graders study anoles and then a drawing is held for the students to win an anole (parent permission must be given prior to the student being entered into the drawing. I would love a pet fish at home and in the classroom. We have a cat and a Bearded Dragon. My son loves animals and would love to own an octopus, a blue tongue skink, a beaver, a snake, an otter, and his list goes on and on and on. We have fish in my classroom. We just got 2 hermit crabs. We don’t have any pets at this time but will have butterflies and gold fish. We have two cats and a guinea pig. ! We also have some fish, including a plecostomus named WIlbur who is older than my son. I am moving into a teacher librarian/learning commons role. I want to get fish for our library. I am so excited for the Dr. Seuss fun I have planned. We have a German Shepard named Harper. We have three dogs , a Golden noodle , English bulldog and Cavilier Spaniel..
3 rescue dogs and a rescue cat. They are my babies. We have a fish but I would like to get a Guinea Pig! I have a fish to calm down some of my students… I think a Guinea Pig will do the same thing. We have African Dwarf Frogs for our class pet. I’d love to get more butterflies for our garden. I have many rescue dogs and cats at my house. Several of our pets have special needs and the rest are all special! We have a white lovable dog with a Mickey head on her side. My classroom does not have any pets. We have had butterflies and fish but I would LOVE to get an ant farm! We have four goldfish and two rabbits! We would love a bigger aquarium and more fish! One of our fish is huge and has such a personality. My classroom has a red Beta fish that we named Rudolph. Every year we have our butterflies. One year I would love for our preschool to partner with one of our doctors and be able to do trout in the classroom. It looks like a fun project and the children get to go to the Smith River to release them— with adult supervision that is!! No class pet, but I have a fat cat. Love dr. Seuss . My kids at school always enjoy our green eggs and ham day. in my 2nd grade class we have hermit crabs, tadpoles, and some years we have chicks and butterflies. My classroom pets are fish. I have a ten gallon fish tank in my classroom. The students enjoy interacting with the fish and learning about fish. The fish match myocean-themed classroom! I would like to get a bearded dragon for a classroom pet and I have a tortoiseshell cat for a personal pet. We have Curious George in our classroom! His curiosity for kindergarten leads to a lot of monkey business. No matter what he gets into, we all have lots of love for our dear friend George. i have a dog at home. I used to have fish in my classroom, but it got to be too much of a problem keeping the tank clean. We have a dog at home, and butterflies & fish in my classroom. i have a beautiful Siamese Cat”Nike” at home. At school, we have butterflies each year to teach life cycles. 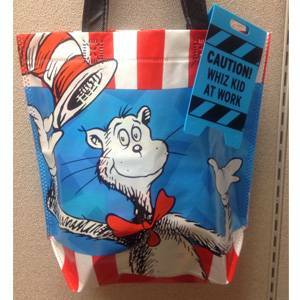 would love the dr. suess giveaway bag! No classroom pets and two dogs at home-Thor and Diego. I personally have a tuxedo cat. I have had goldfish in my classroom, but I would LOVE a hedgehog! My 3 month old son and I have three dogs – Patches, Diamond, and Smokey. At home…2 cats, 2 rabbits, & a dog. I have a teddy bear (1/2 shih tzu and 1/2 bichon) named Joey who greets me ever day after school. I used to have African Clawed Water Frogs in my classroom. The kids loved to watch them develop from egg to frog! I have a guinea pig named Geno. My class wrote letters persuading me to get a class pet. We settled on a guinea pig. I absolutely adore him. We aren’t allowed to have any pets because of allergies of children. We can and I have had fish, tadpoles, butterflies and water frogs. We have a pet bunny, named Bambi. She loves to check hair and loves to play on my daughter’s bed. We have a wonderful dog at home named, Annie. She’s very hyper so I’ve never brought her to class for a visit. In our classroom we had crabs before. We’ve also had a pet toad that we rescued from our window well. We are going to reading “Wish for a Fish: All Sea Creature” for our ocean theme in Preschool. Love Dr. Seuss books! Have a goldfish at school. At home a bearded dragon named Puff and a Beta fish named Bubbles. We love Dr. Seuss books! We really want to get a dog when my daughter is a bit older. I love Dr.Seuss I always get into character on his birthday. My kids love it. I have a border collie named Ty and a cat named Simba. They belong to my son, but we all take care of them. I personally have a dog and two rabbits! If I could get a class pet I would get a guinea pig growing up I had a guinea pig class pet and I loved getting picked to take him home on weekends! I have three miniature schnauzers named Fritz, Luna and Charlie and a simease cat. No classroom pets at this time because I am a traveling special education teacher. I would love to win this bag and the supplies. We have a German Shepherd, Max, who will be 2 years old on July 23. We rescued him when he was 8 months old. He is our fourth German Shepherd! Our vet thinks he will be a puppy forever – full of energy and not slowing down. Everyone at work thinks his name is No Max! I have a 13 yr old Pomeranian and an outside calico cat. I have two turtles in my classroom. I have enough animals at home, but am interested in something new for my class.. I’m not sure what I want. Maybe the new Dr Seuss book will help! I have a hyper guinea pig who after 2 years still fits on the palm of my hand. We have two dogs. One just a lab puppy of one year and full of energy. The other one is a lab of eleven years and tries to keep up with the pup. We really enjoy having them. At home, we have a chocolate lab named Chomper! I’ve had a guinea pig before as well as butterflies. We have a beta fish, a class bird (Sassy), and our plants which the kiddos all named and love. I have a dog at home. At school we have fish, and we do butterflies in the spring, also ant farms and soemtimes I do praying mantis as well. We have a rescue cat named Siri. We tried adopting another baby a little while ago, but both kitties told us that they need to live separately. While Dani is now in another home, she will always be in my heart. I’ve always loved raccoons growing up but know that they are not meant to be domesticated. So, we’re happy to be blessed with the four-legged baby that we do have. Congrats ahead of time to whomever wins this great bag of goodies! We have butterflies and fish. I would love to win this! I’m planning a pet unit this year for my first graders! We have a Southern Curr dog named Gordy, and my husband runs a dairy farm so we also have around 200 cows! Not all of them are pets, but some are very loving and playful. My favorite classroom pets were the caterpillars I ordered to teach my preschoolers the butterfly life cycle. Although we didn’t have them very long of course, the kids loved them and named them all! I would love a hamster or guinea pig. Something the kids can interact with. We don’t have a classroom pet yet. I am trying to figure out one that would be easy to care for even throughout the summer. At home I have several pets. Yes they are all pets. We have 6 Nigerian Dwarf goats, 3 turkeys, 5 ducks, chickens, 5 beagles, 2 Great Pyrenees, and my indoor micro mini pig. I would love to have this for my class!! We have 2 dogs, Star and Skye! I absolutely love Dr. Seuss books. Our family pets are cats. I have had lots of classroom pets in the past, but none right now. I do plan to do an ant farm and a butterfly release during the next school year. This would be awesome!! This years school theme is Dr. suess. Oh the places we’ll go. We have a pet guinea pig named “Raider”. I would love to add this to our theme and make it a take star student bag. My room is decorated in Dr Suess and my kids love it. last year was my first year to teach so I don’t have a pet. Would love to have an ant farm. We just got 2 hamsters….can’t wait to introduce them to the kids!! At school we had fish from the science kits. At home my family owns a wiener dog named, Sparky. I would love to own baby turtles. We have 3 cats – Fudge, Ptera and Cera. I love Dr. Seuss and my entire classroom is decorated with a Dr. Seuss theme. My classroom pet is Fodhopper Fuzzyfoot the rabbit. I originally bought the rabbit from a student whose family was breeding them to sell for food. They were apparently breeding faster then they could sell them. So I adopted one for my class thinking I might have to take it home or send it home with a student over breaks. The bunny soone became part of my family and comes and goes with me daily in his own carrier/purse. He shops and goes camping with me and is basically my big baby. The kids adore him and he is now twelve years old and still going strong! We two dogs and a fish. I would love to have a pet fish in my classroom! No class pets. I have a cat at home. I have a Pom-Chi that just turned Two years. I rescued her last year from an abusive home. This was also right after my dog of seven years passed away. I swore I would never get another dog, but I found Sophia in a newspaper ad and it was love at first sight. We have been together ever since. At school, I don’t have any pets. We are not really allowed to have them but if I did, I would have a collection of insects to use during our science time. I do not have any classroom pets :(. At home, we have 2 male cats and 1 beta fish. We are hoping to get,a dog soon. One fish, Two fish, Red Fish, Blue Fish! My students love having fish in the classroom, We had Guinea Pigs, but they got to expensive for me to have. One of my students adopted them. I have two dogs, a 15 year old black lab named Nita and a 12 year old beagle named Rocco! We have a turtle for the classroom named Clutch, who obviously live with us at home for the summer!! We have a Puggle and miss our miniature Sheltie. We would like another miniature Sheltie. We use to have a guinea pig named Tickles at one of the libraries I worked at. The kids absolutely loved hearing her squeal! My family and I do not currently have any pets. We had a rabbit named Sharpay (my daughter’s favorite High School Musical character), but she died last fall. We are considering adopting a cat from the Humane Society. As for classroom pets, we do not have one. It is extremely hot in our classrooms, plus we have so many children with allergies it is hard finding the perfect pet.. We do have a school aviary, so we all enjoy the birds. My classroom has 2 dumbo rats. One is named Depserouax. He is our gentle sweet rat, We named him after the book. Then we have Thor. Thor is our big guy. We called him Thor because he’s protective and pretty big. We love them!! I have 2 rescue cats, and a hamster! My precious Pomeranian passed away in November and I dearly want another! We love our red heeler Ace. She is a spunky dog that keeps up with our two young boys even though she is almost nine. We have a dog and a cat at home. At school we have had butterflies and hope to get a guinea pig or bird this year. We have no classroom pets, put have many parents that are vets. At home, we have dog that is a bump on a log. I have 2 cats at home — SkippyJack and Raleigh. We have a goldfish at school. Her name is Sunset. Thanks for offering a great giveaway! I have had many animals as classroom pets…. Hedgehog, prairie dogs, turtles, fish, guinea pigs, hamsters, rabbits, and frogs! I have a Labradoodle that I would love to train to be a Reader Dog! She is a precious girl who loves for kids to love on her. I have a Labradoodle that I would love to train to be a reader dog in my classroom. She is precious and enjoys children who love on her. We have two rescue pups! I have stuffed animals only right now, but would love a library cat to name Dewey. We have a family of guppies (about 17) that started at just two. We would love to have a pet hamster! I would love to have a fish for my preschoolers. Hi! We have beautiful birds that visit the backyard to eat from the fruit trees also we collect and feed caterpillars to later release the butterflies. our classroom pet is a guinea pig named Princess Sally Dora. Our class pet is whatever critter our 3 year olds find on the playground. We have had tree frogs, grasshoppers, Rollie Pollies, crickets, even a tiny snake! One of our Pre-K classes every year uses the Cat In The Hat Theme! We have a 10 year old boxer named Rocky, and a kitten that decided to join our family last month named, Sandy. We have chicks, butterflies, and ladybugs each year! The kids absolutely love having them in the classroom! i would love a hedgehog as a class pet. We don’t have pets, but all of our friends are happy to leave their dogs and hermit crabs with us when they go on vacation. Someday we hope to have our own dog. A big and gentle 150lb Great Pyranees. I love Dr. Seuss and his books. I am currently at the National Education Association Representative Assembly and they have a huge booth honoring Dr. Seuss and Read Across America. Teachers are awesome and everyone needs to read a Dr. Seuss book everyday to children and adults across America. Make reading fun again!!!! At home we have 2 cats and 1 dog. At school, we hatch chicks and keep in touch with their progress when they go back to the farm. My K-2 library has dozens of book buddy pet friends. During silent reading time the students get to pick a pet and a reading spot. At home we have two dogs who love to be near us. I did not have a class pet this past school year. We have had fish, a tarantula, a rabbit, and a hamster. I hope to get a pet this coming year for my class. My classroom is done in Dr. Seuss. So I would like to get fish for my classroom because it goes with the theme. We currently have a 6-pound teacup yorkie and are looking to get another from a rescue nearby. We have a dog and 5 cats. Pets at home: 2 dogs, 2 cats, 10 cichlids and a rabbit. I would love to have a cichlid tank in my classroom. Dogs, of course! We had 21 dogs growing up in our family. Unconditional love! I would love a salt water fish tank in my room! I have a peach-faced love bird and a turtle at home. I bring them to school to visit during our pet theme week. In our classroom we have beta fish. We also create a worm farm and insect home during those theme weeks. I have no classroom or family pets! My daughter would love to have a turtle! I have raised catfish from eggs in a tank at school in my class . Now I have a dog at home. He is a toy poodle.my students can’t wait each day to hear another Max story! As a special treat, my principal has allowed each year at the end of the school year to let my husband bring Max for a classroom visit. I take pictures of each student holding Max and give them each a copy. The anticipation through the year makes it well worth the wait and what a special surprise to end the school year! Max loves his visit too! No pets in the classroom. I have a very picky cat named Bella at home. Want this prize for my Pre-K classroom. I would like to have a pet fish! I think it would be so fun! At home I have an American Mastiff named Brynn. She is three years old and the students in my first grade class LOVE hearing stories about her and seeing pictures of the fun things we do with her. She really is a gentle giant! I am planning on getting a dog in the next year. We are going to get it from a shelter! At home, we have a black cat named Sophie. I adopted her during my first year teaching, just after my home going through Hurricane Ike. In the bag, I hope there are lots of back to school goodies! I have a salt water tank at home. At school, I do not currently have a pet because I just switched schools; however, in my old school we did have my students families share their farm birds ranging from baby turkeys and baby quail to baby chicks. We even got to see the not so baby turkey as he grew up throughout the school year! In my kindergarten class I have a fish tank with a variety of fish. We have a blue healer named Yogo – named after the blue saphires from Montana as he is also from Montana. We have a wonderful little rescue dog named Indiana Jones ( Indy for short ). We have a sapphire blue beta fish. My classroom theme is Dr. Seuss and last year his name was blue fish, I am excited to see what my students will come up with this year.